Led by Saudi Arabia, several states in the Middle East and Africa severed ties with Qatar on June 5, accusing the gas-rich Gulf state of supporting terrorism and Iran. Turkey's president is in Qatar to mitigate some kind of solution to solve the Gulf crisis. TRT World's Soraya Lennie reports from Doha. Qatar’s Defence Minister, Khalid bin Mohammad al Attiyah in an exclusive interview with TRT World’s Soraya Lennie on the dispute with Gulf states. TRT World's Soraya Lennie's One on One interview with Turkey's Ambassador to Qatar Fikret Ozer on Qatar diplomatic crisis and Turkey's stance on it. Still under blockade, Qatar has rejected a list of demands by the Saudi-led coalition stating that they would compromise the Gulf state's sovereignty. Hopes of ending the diplomatic standoff are diminishing as the coalition has reiterated that the points are non-negotiable. Qatar has appealed to the international community to help diffuse the spat by lifting the embargo placed on them. Will their pleas be heard? And is there a looming threat of invasion by Qatar's GCC neighbours? Now to the continuing crisis in the Gulf. Saudi Arabia, Egypt, Bahrain and the United Arab Emirates say their political and economic boycott of Qatar will remain in place. The foreign ministers of the four countries blamed Doha's 'negative response' for the continued blockade, during a joint press conference in Cairo. The dispute erupted last month when they cut ties with Qatar, accusing it of supporting terrorism. Soraya Lennie has the story from the Qatari capital. Saudi Arabia and its allies that cut ties with Qatar are meeting in Cairo Wednesday to discuss the diplomatic crisis in the Gulf. 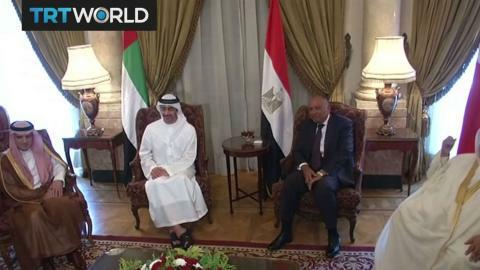 The meeting coincides with a deadline imposed on Qatar to accept demands set by the four Arab nations or face further sanctions. When we hear about demands to close down Qatar funded media outlets, minds immediately default exclusively to Al Jazeera, but actually news portal, Middle East Eye and other are among those Saudi Arabia wants shut down. David Hearst is the Editor in Chief of Middle East Eye tells why. Countries boycotting Qatar agree to 48-hours extension on demands deadline. Qatar's foreign minister will formally give Kuwait's ruler the country's response to demands. The closure of the Al Jazeera media network is one of the main demands of the countries enforcing the blockade. Since the crisis in the Gulf began, the network has been accused of bias, its journalism attacked, and its English language website hacked. Qatar's foreign minister rejected the demands by four Arab states and said conflicts should be worked out through negotiation, not by imposing ultimatums. TRT World's Zeina Awad has more details. 13-point list of demands handed over by Kuwait, demands include closing down Al Jazeera network. Saudi wants Qatar to cut all ties with Iran; demands include closing down Al Jazeera network. After the Arab world's most dominant powers cut ties with Qatar, all transport links were closed. Many remain stranded at Doha airport after flights to the countries involved were cancelled. Trump tweeted about his visit to the Middle East and appeared to give his support to the Saudi-back alliance against Qatar. After several countries cut off air travel to and from Qatar, many destinations in Europe and the Middle East can only be reached via another country or longer routes. The unexpected cutting of ties by Arab powers with Qatar has left its people perplexed. But, on ground there is still no sign of any economic slowdown. TRT World's Iolo Ap Dafyd reports from Doha. The United States says Saudi Arabia and its allies will soon present Qatar with a list of demands. It's meant to resolve the diplomatic dispute between Doha and several Arab nations. Soraya Lennie has more. A royal decree relieved Saudi Crown Prince Mohammed bin Nayef of his post and replaced him with Mohammed bin Salman who becomes deputy prime minister and retains his defence and other portfolios, Saudi state agency SPA reported. In a separate development, Qatar has announced a 12 billion-dollar deal to buy F-15 fighter jets from the US. Nicole Johnston reports from Doha. Qatar has been blockaded by its neighbours for more than a week. Both sides of the crisis are on a diplomatic offensive in Europe and the US to try and get support. So far, there's been no hint of resolution. Saudi Arabia and its allies say Qatar is funding terrorists and that's why they've taken action. But as Nicole Johnston reports from Doha, some people think it's more to do with Gulf rivalry. Qatar's Foreign Minister has condemned the Saudi-led blockade on the country, calling it illegal. He was speaking in Paris, as part of the Qatari government's diplomatic offensive across Europe. They include Yousef al Qaradawi, chairman of the International Union of Muslim Scholars. Qatar has dismissed the so-called terror list as baseless. And says it's position on countering terrorism is stronger than many of the other Gulf arab states. Saudi Arabia, the UAE, Egypt and Bahrain have already cut ties with Doha. Iolo Ap Dafydd reports from the Qatari capital. It is not the first attack, but it is one of the most sustained. The Qatar state broadcaster has also come under fire. TRT World spoke to AJ's Jamal Elshayyal in Doha.